Most people without knowledge would run for a plumber to install a tap in the garden. As it is a pretty simple job if you are slightly handy you can do it yourself. 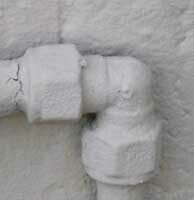 In this article I am going to describe how to fit a new tap in close proximity to your main water supply piping. See photo above. For taps that need to be fitted further away you will need a couple of metres of pipe which can either be placed underground or along an existing wall. When measuring remember to add the up pieces from ground level if you are going underground with your piping. Elbows and T pieces will be the two fittings that you will use for most jobs. T pieces are used to add a new piece of pipe into the mains while elbows allow you to go around corners. These days plastic pipe is just as good as copper piping and also a lot cheaper. I use polycarp which is a half inch (15mm) red coloured plastic pipe which can be used for both hot and cold water. As with copper pipe this pipe cannot be bent at right angles but can be bent slightly as needed. For outside taps a plain brass 15mm tap can be used but you can also use plastic taps. The pipes and fittings will fit both taps. 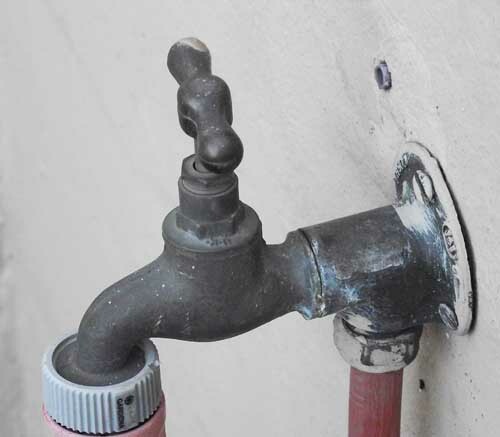 For outside use ensure that the tap is threaded on the spout to allow you to fit a hosepipe to it. How to install the tap. Decide where you want to install the tap. If the new tap is to be installed close to the existing copper pipe mark the spot on the copper pipe where you will install the T piece. In this instance the tap will be installed at the same height as the cut you will be making in the copper pipe. See Fig 1 above. Back Plate with pipe fitting into it. Outside taps come with backing plates to allow you to fit them to a wall. The backplate includes a fitting which allows you to fit the pipe to the tap. In our example the backplate will have to be installed sideways (at right angles to the mains pipe you will be cutting into) so that the opening for the pipe is opposite the T piece that you will fit into the mains pipe. Once you have lined up the two fittings mark the wall where the holes need to be drilled to fit the backplate. Drill the holes and screw the backplate to the wall. Back Plate with tap fitting into it. There is a threaded hole in the backplate for the tap to be fitted into. You can fit the tap at this stage or later. To fit the tap you will need some plumbers tape which must be wound around the thread at the back of the tap. Wind the tape around the thread in the opposite direction to which you are going to screw the tap in otherwise it will unwind when you tighten the tap. Plumbers tape is a special tape used around threaded fittings to stop leaks, and should be purchased at the same time you are buying your other fittings. 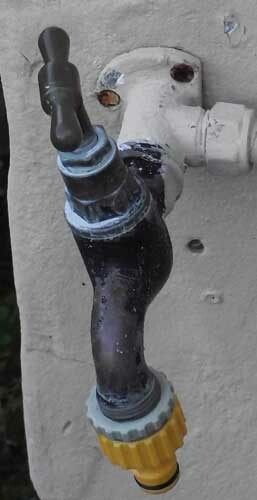 Tighten the tap as far as it will go and adjust it so that the spout points downwards. It is now time to fit the T piece into the mains pipe. This is the most difficult part of the job. 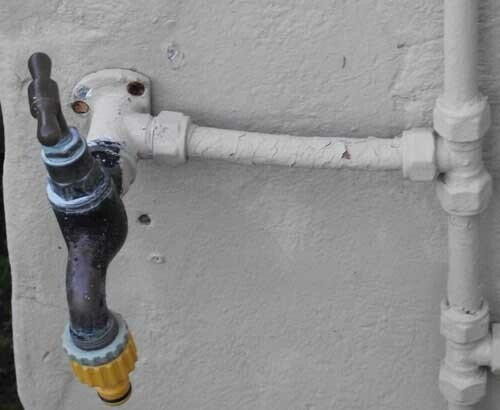 Firstly you should clean off all paint and dirt on the mains pipe as the lock nuts and cones will not fit onto the pipe if the paint is present. The pipe should also be properly round so that the cones will fit snugly and not leak when you fit them. Line up the T piece with the tap fittings so that the pipe you are fitting will fit snugly and perfectly into the hole of the tap fitting and the T piece. This image shows how the pipe should be fitted to get a snug fit and to minimise leaks. With lock nuts still in place on the t piece mark the mains pipe where the outside edges will be once the T piece is fitted. Now measure the depth of the T piece where you are going to fit the mains pipe into. Once you know the depth mark the mains pipe measuring from the outside edge inwards. ie There should be two marks approximately 10mm from the original outside marks. See photos above for more detail. The T piece must fit into the gap that you are about to cut into the mains copper pipe. Before cutting ENSURE that you have switched off the water at the mains otherwise you will have a flood. When you are ready cut the mains pipe on the marks at right angles to the pipe. You should have a piece about 25mm in length once you have cut it out of the pipe. See photo above. Clean up both edges of the pipe. Take the lock nuts off the t piece on all three openings. Slip the lock nut onto the mains pipe followed by the cone (brass ring) and then slip the t piece onto the pipe as far as it will go. Hold it in position and slide the cone down the pipe until it touches the T piece. Slide the lock nut down and screw it onto the t piece. Do the same on the other side. 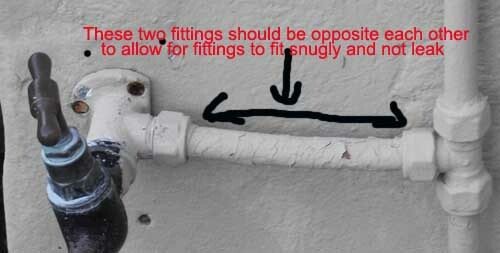 You might have to move both sides of the mains pipe outwards to be able to insert the bottom end of the pipe into the T piece. 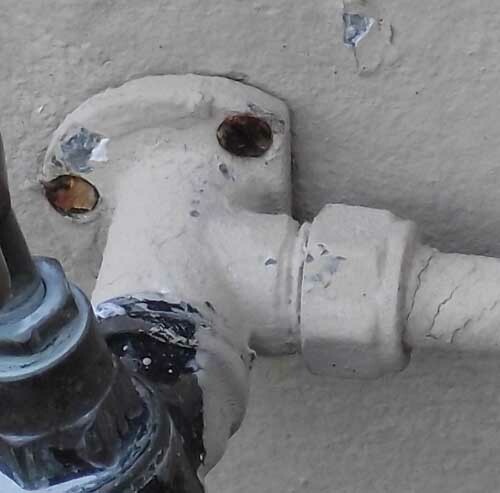 Once the pipe slips into the t piece push the fitting back against the wall and turn the bottom locknut onto the thread so that open end of the t piece can still be moved. Its time to add the new piece of pipe and finish the job. Cut and measure the pipe you are going to use to join the tap and mains. Remember that the pipe you are cutting fits into the holes on the side of the backplate and also into the t piece, and, that the depth of these holes is about a centimetre. To get the exact depth push the pipe into the fittings and measure the depth of the hole. Once you know the depth add that measurement x2 to the gap between the outside edge of both fittings and cut the pipe accordingly. Before fitting the pipes into any fittings sandpaper the edge of the pipe lightly to get rid of any rough edges. Most people will use a small hacksaw to cut the plastic pipes but there is a quicker and easier way. I use a lopper or garden cutting tool which gives you a nice clean cut and a straight edge. A lopper or garden cutting tool however only works with plastic pipes so don't use them for copper pipes. 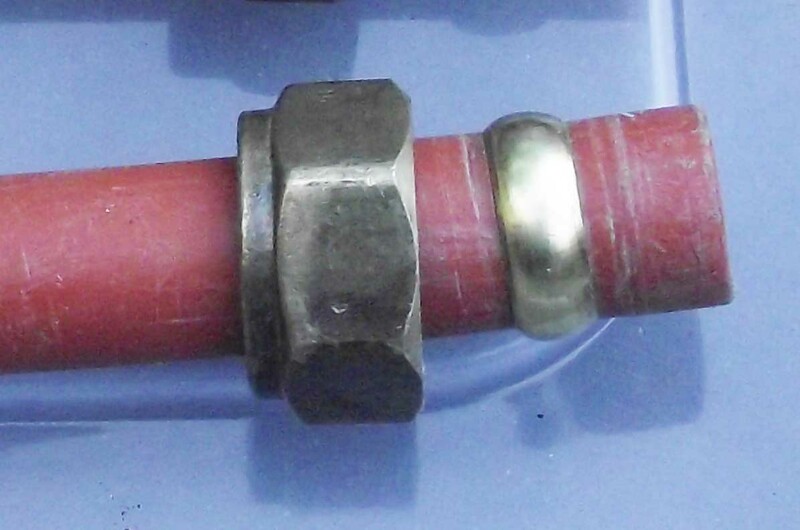 To fit the new piece of pipe slide the lock nuts and cones onto both ends of the pipe (See photo above.) then insert the pipe into both fittings and as described earlier push cones up against the fittings and screw on the lock nuts. Tighten up all the nuts on all the fittings. Don't get too strong as these brass fittings strip quite easily. Once everything is nice and tight you can turn on the mains water and check for any leaks. If there are leaks try and tighten the nuts a bit more. Please note that the brass cones are sealed to the pipe when you tighten the lock nuts and if you find leaks and tightening does not stop the leak the cone could be the problem. It might not be seated properly. (should be at right angles to the fitting to give a proper seal) If a cone is slightly out of shape it must be discarded as it will not seal. Once the cone is welded to to pipe it cannot be taken off and used elsewhere. Once the cone is welded to the pipe and it proves to be faulty you will need to cut another length of pipe and start again installing the pipe. 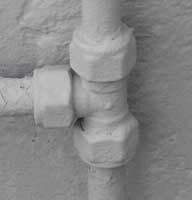 A too short of pipe will also cause leaks so ensure that there is sufficient pipe to fill the gap between the fittings. The above will work for all outside taps. Inside taps work slightly differently as the bronze part of the tap is normally covered by chrome bits and pieces.